Michael S and Summer help Michael M celebrate Episode 300. That's a lot of podcasts to record and edit. Get your "300" jokes out of your system now. Go ahead, we'll wait. Michael S has a demo of a new shareware application that will convert PDFs into ebooks that can be read on the iPod Touch. See Stack's website Stormwolf.com for a demo of his converted Talion Revenant, and see zapptek.com for the software. Interview: Mike M, Mike S and Summer talk with editor John Joseph Adams about Wastelands, the newest collection of post-apocalyptic fiction from Night Shade Books. John tells us about acquiring the stories (including one by Stephen King), putting the collection together, and what appeals to and attracts him to post-apocalyptic fiction. Discussion ranges from the inspirations and influences of post-apocalyptic stories, to the extensive website that accompanies the book, and the joy of acquiring a Stephen King story. 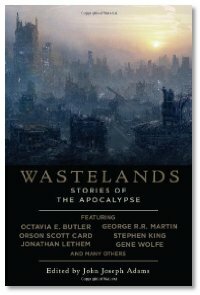 There are 6 free short stories from the collection available at the Wastelands website, interviews with the contributing authors, and there's also a Wastelands Trailer at YouTube that was put together by author Tobias Buckell (who has a story in the collection). Go get this collection soon... the first printing sold out, and the second printing is already nearly sold out. The Library: New this week: Worldweavers: Spellspam by Alma Alexander; The Hidden City by Michelle West; Staked by J. F. Lewis. Darn - I guess I'm going to miss out on the Second Life goodness. Second Life just doesn't want to run on ANY of my 'puters. Aww. The linky winky no worky jerky. The page has link to video in youtube on how it works. Listening to the Library segment (which I always love, btw). I was inspired to come up with a brilliant idea for a novel. It would be about a group of undercover cops who are also vampires. The title? "The Stake-Out" Pretty good, huh? Congrats on 300, guys. 🙂 Appreciate the news and the interview. Keep 'em coming!